As we've mentioned, our goal is to carry out our farm endeavors in the closest way to mimicking nature as possible. One dynamic we have become very familiar with is the predator/prey relationship that dictates the rhythms and movements of herd animals. In our system we, along with our portable electric fence, play the predator role in moving our animals across our grasses - mimicking the way predators have pressured herd animals for a millennia. There is of course, always the issue of real predators. Our location is especially welcoming to mountain lions, bobcats, black bears, coyotes, and foxes. It would be impossible for us to fence these threats out, and in the modern age, we don't shepherd our herds and flocks 24/7 like they used to. 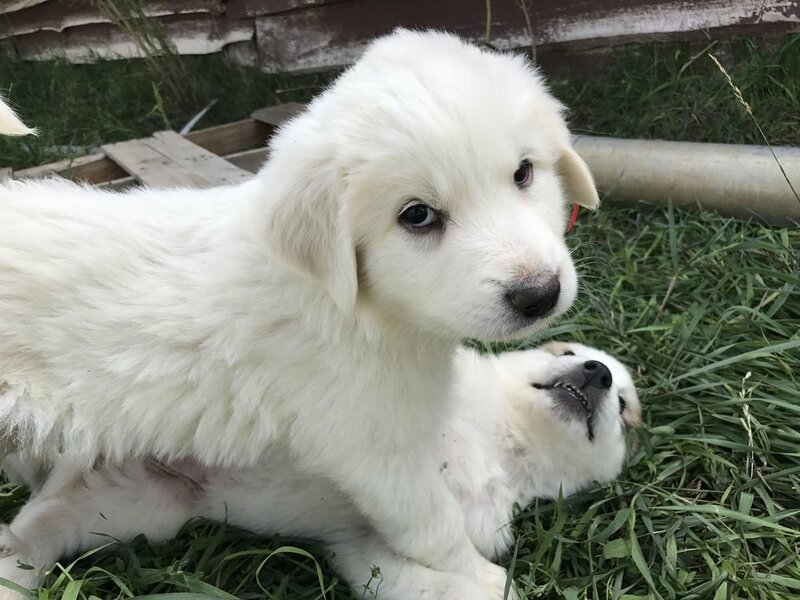 We instead depend on thousands of years of guarding instincts manifested in our Great Pyrenees. You can read more about the breed's history here. 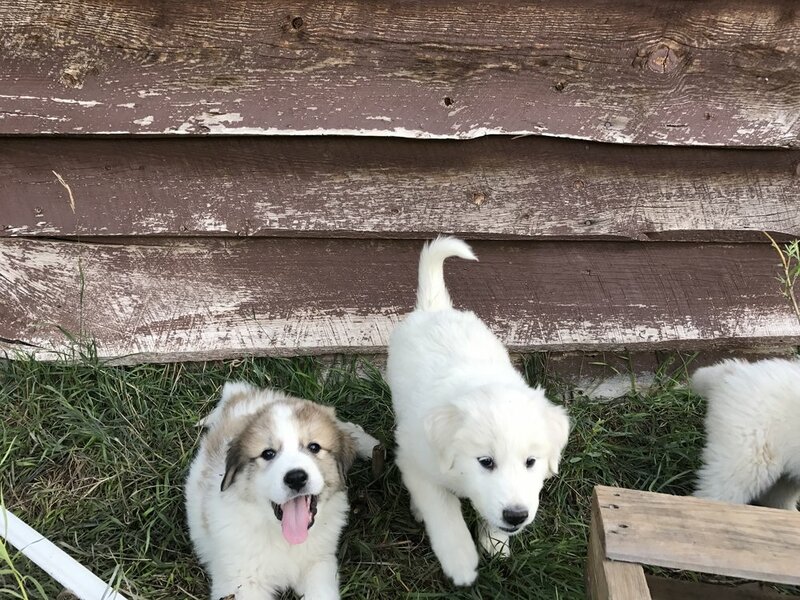 We decided on Great Pyrenees for a number of reasons. First, Scott's uncle had been raising sheep in Missouri for a few decades and he swears by them. We also found their history attractive, their size and cold hardiness, and overall temperament. 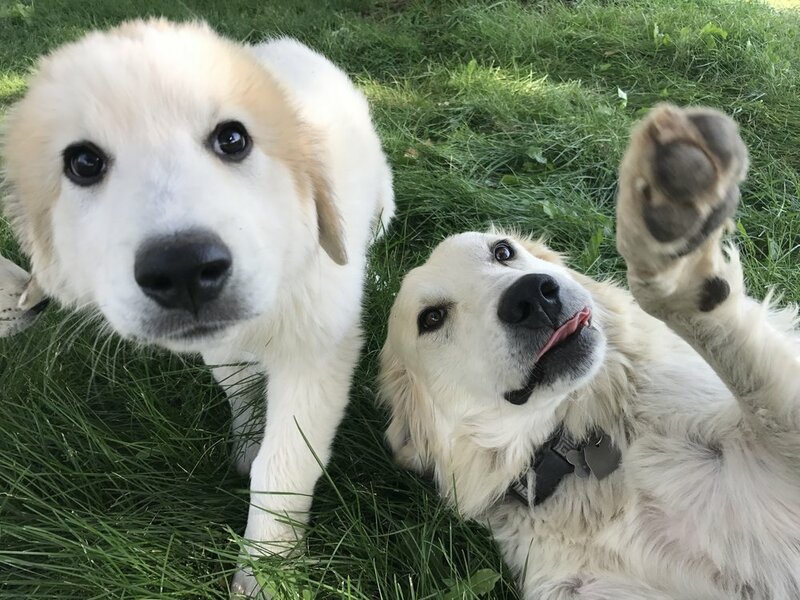 We found a fellow Coloradan who breeds Pyrenees especially selected for their friendliness towards humans while maintaining a good guard instinct. Their line is called the "Colorado Mountain Dog." You can find out more about Wendy's dogs here. I must say we had a very interesting experience driving our first two down to Mancos from Fort Collins in a tiny Subaru! 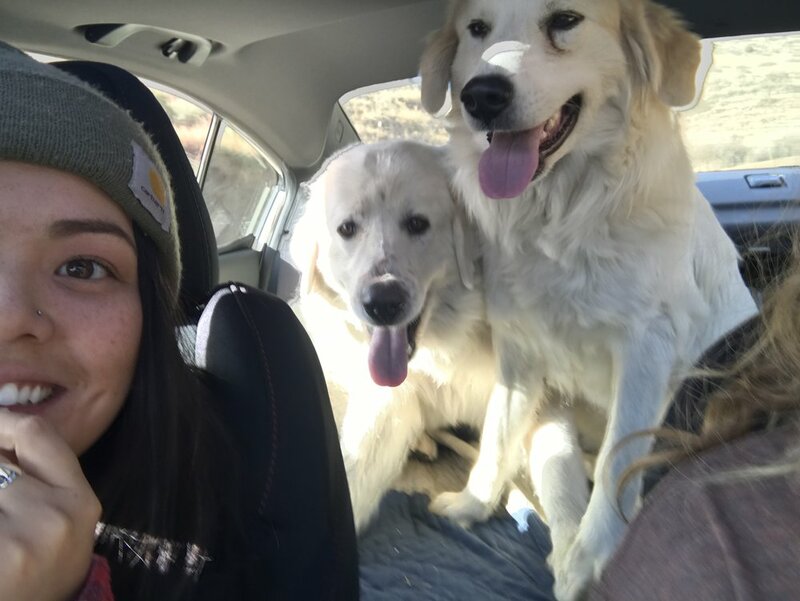 (no matter how many times we've vacuumed there is still white dog hair)..
We brought home Aspen and Monarch at 15 months old last fall. They were SO thrilled to be introduced to their new kingdom. We familiarized them to their new territory first by going on perimeter walks with them on a leash, letting them mark as they pleased. The first few days were...um, a challenge. We were nervous to leave them outside free roaming so we attempted to put them leashed, in the fenced in kennel in the back yard. Ha! We woke up to find 2 chewed through leashes and an empty 6 ft tall kennel. Eventually we decided to let them find a cozy place and trust them to not run away in the night. Miraculously it worked! We feel its important on these posts to be completely honest. The truth is, when we first arrived here in October of 2016 we were under a lot of pressure and antsy to get started. Looking back we got these dogs way sooner than we should have. We underestimated the power of their imprinting and brought them home before we had any livestock here for them to guard. As a result, our first two became very attached to us. They valiantly watched and guarded us outside our bedroom every night. Being the young (sort of) still pups that they were, they still desired to explore and expand their territories. We had a couple weeks of very high stress awaiting their return, fearing they might have wandered too far and trespassed where they might not be wanted. We had a couple phone calls from neighbors in frustration asking us to control our dogs. Returning back to one of our holistic goals being "NO STRESS," we had to sit down and get serious about practical solutions. We sought the advice of our Pyrenees mentor, Uncle David, who so graciously sent us his solution in a heart beat: the Garmin Alpha 100 + TT15 Collar COMBO. What an amazing technology! We were able to draw out our property boundaries on a GPS map that would notify us when the dogs left their territory. The collars give you an option to tone or shock them (we always tone) so they learn their boundaries. They have been 100% worth it. Just when everything began to run smoothly with the dogs - they were in a great perimeter guarding routine, not running away, all the coyotes and foxes had disappeared, etc - I received a frantic phone call one day from Scott in the field. "Margaret!!! I think Aspen is in heat!! What do we do?" Sigh. We decided they were still too young for puppies and that we needed to keep them separate during her cycle. From experience we knew kennels and leashes weren't going to do the trick. Luckily, we have 11 steel boxes with sliding doors and windows 8ft up off the ground, a.k.a. horse stables. We alternated the the two in the stables. It worked for all about 1 day.... Monarch, our escape artist somehow managed to climb up the steel wall and out the 1'x3' window!! Amazing. We closed the window. Poor Monarch howled for the next 2 weeks during the day. When Aspen's second heat cycle came around, we let the magic happen; and on June 14th we welcomed 10 puppies - 5 girls, 5 boys. One of our Mangalitsas also birthed 3 piglets. What an incredible day that was!! We sent most the puppies off to other happy homes, and decided to keep 2 here to guard our ever growing churro flock. It became quite clear soon after puppies that our mama Aspen had no interest in returning to work. It got to the point where she would chase after Monarch when he was trying to work and try to get him to start playing. Thanks to our GPS collars we were able to identify her as the culprit who led them off property. Also, (understandably so) she would want to lay in the shade and play with her pups. We lovingly understood it wasn't her calling to be a guard dog, and with sad hearts we had to make the difficult decision of letting her go to a different home. It was hard for us to let her go, but we are grateful for our friend Michael, who has given her a happy new home - where she accompanies him at the Cortez Middle School Garden, where she gets to work and play with the students. With his biggest distraction gone and rounding the 2.5 year marker, something has clicked within Monarch. He is guarding better than ever. We don't have to worry about him running off, and he is doing well training the two pups as a single dad. After a bumpy first year with a steep learning curve with our guard dogs we have finally settled into a nice rhythm. They are truly incredible animals. They have taught us the lived meaning of the Permaculture Principles "small and slow" and "accept feedback" to an unimaginable degree. They have brought us to a new level of patience and humility. They have given us unending joy and laughter and the peace of mind every farmer desires. The best part? 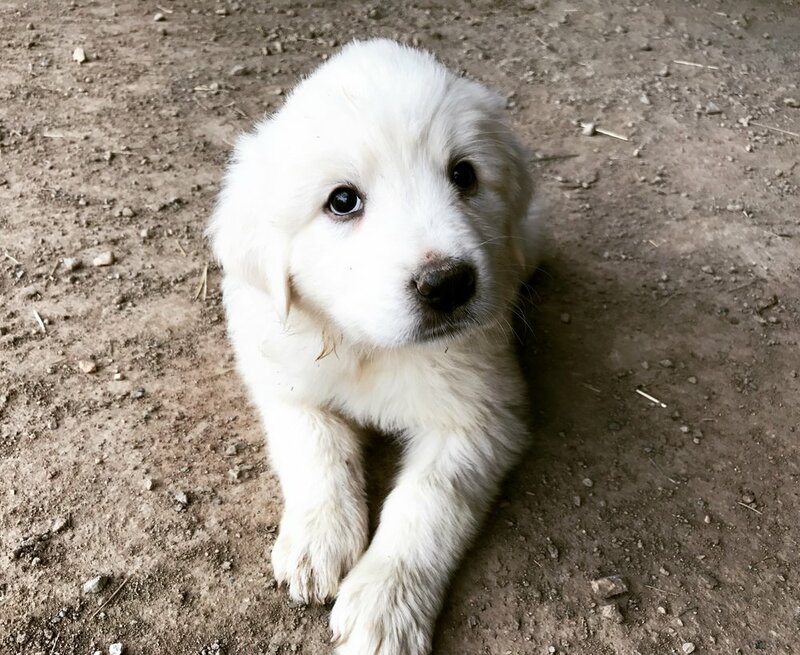 We haven't lost a single animal thanks to the great work of our Great Pyrenees.